In this Public Speaking course flipping helps the student be “emerged” into the content. This is accomplished using ‘Learning Modules’ to gain competency along with WorkPacs for practice, and ComPacs to develop their own content (speeches in this case). The ‘Learning Modules’ were created with SoftChalk and include auto-graded assessments and activities. 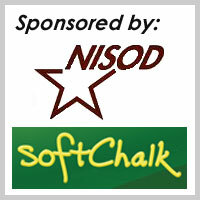 The SoftChalk ‘Certificate’ feature is used to motivate and document! Thus, both student and teacher know the content has been learned. The student is pleased with the Certificate and earns points for it, and there’s no hand-grading for the teacher. WorkPacs (Work Packages) are created for student practice. They are imbedded in the Learning Module and use Bloom’s Taxonomy levels to indicate the expected learning level. These ‘Practice’ WorkPacs are automatically graded, and students earn Participation Points with successful completion. ComPacs (Competency Packages) align with the WorkPacs, but now students enter content related to their own projects. This requires some teacher-review and hand-comments. However, after students learned the content and application through Learning Module, Self-Assessments, and WorkPacs, the ComPacs are submitted in good shape.